what is her entrance voiceline again? Does she copy the cards that are on the board or the cards that are in your hand? I believe unless otherwise specified it would refer to the board. But maybe actually more interesting in something like Zoo as refill. I'm actually glad to see this kind of combo card in the set. I was worried there weren't going to be any. This goes directly to my Reno-cry Rogue deck. Shudderwock shenanigans again? Can it select himself? Live on Monday, Wednesday, Friday and Sunday, at 6PM CET. Latest thread: Value Town 203 | Dean Ayala on Nerfs and future. And this card is broken af. It better be board because hand is too OP. 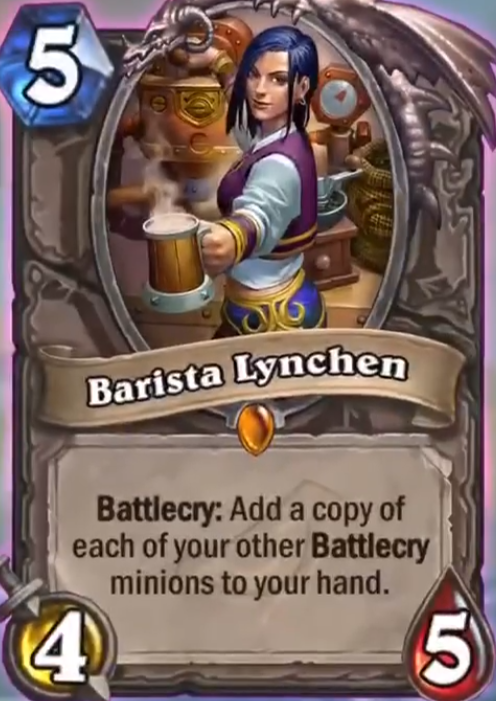 I'm guessing to have to control those Battlecry minions on the board and then play Barista to get the value. Am I reading this right? Seems like a win more situation if you have to wait a turn. Or you play this on turn 10 with some cheap battlecry minions. And this card is broken af. Makes Vonne look like a joke. This adds copies of your board to your hand. Vonne adds extra copies of your hand to your hand. If this is hand and works like Voone, it's nuts. If this is board, it's practically unplayable? You'd have to play her with another battlecry minion, and the reward is getting another copy? I don't see it. Wait if this is the last neutral legendary then what about zayle, shadow cloak from the pve adventure? This card is not that great. You need a board with battlecry minions first. Is she serving a pint of steaming hot freshly ground coffee??!! I'm in love! sonya and zola make this infinite?